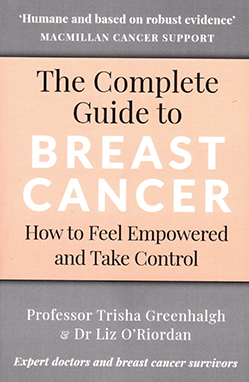 Based on current evidence and UK guidelines, this is a comprehensive book explaining breast cancer from diagnosis to recovery. The authors, a GP and a surgeon, also offer personal perspectives on their own breast cancer diagnoses, as well as their expertise, to help inform patients. This could be a useful read for nurses or health professionals new to breast cancer because it gives a good overview of the management and impact of the disease. There are some good chapters on treatments, while the exercise section is excellent and informs active and inactive people how to get this aspect of their life on track. However, the chapter on staying healthy during treatment includes seven pages on ‘cancer diets’, yet mentions a balanced diet only briefly. The book also refers to several websites. Most of these are linked to Breast Cancer Care and Macmillan, but it also includes US websites I would not recommend to patients. Although most of the information this book contains is freely available from Breast Cancer Care and Macmillan, it could be useful for people wanting to buy a single resource to help their understanding of treatment and recovery.